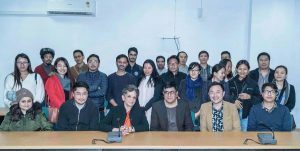 Academicians and members of the Naga Scholars Association who attended the “New Year special talk,” at the School of International Studies at the JNU in New Delhi, on February 8. Dimapur, Feb. 11 (EMN): An academic discussion in Delhi hosted by Naga scholars recently broached various issues concerning the idea of democratic society’s chief and apex community vanguard—Civil Society—and the role of civil organisations in being the chief guardian of a people, their welfare and wellbeing. One of important questions related to community guardianship and people welfare was about how to find ways for people who speak different languages, believe in different religions and belong to different communities, to live together in harmony to enhance the rich diversity of India. The Naga Scholars Association (NSA) organized a “New Year special talk” on issues concerning civil society, with the thematic slogan being ‘The troubled biography of civil society’ (sic). A press release from the organisation on Monday stated that the discussions were conducted in the School of International Studies at JNU, in New Delhi on February 8. A political scientist, Prof. Neera Chandhoke, was the resource person for the event. She is also the National Fellow of the Indian Council of Social Science Research, and a professor of political science at the ‘university of Delhi,’ the updates stated. ‘Civil society also means sense of polite, civilized something that is aesthetically developed,’ the press release quoted her as having stated. Further, Chandhoke said that the objective of civil society organisations is not to overtake the state’s power or to compete with the ruling power. Its objective is to safeguard the constitution for the greater good of the society, she said. “When a society develops a culture of debate, the outcome will be always fruitful as debates can also be on good citizenship and how citizens can live a good life ethically, culturally and aesthetically,” she said. Further, Chandhoke elaborated how civil society organisations developed in India in the 19th century and early 20th century. It developed as a function of the ‘freedom struggle’ and more importantly from the social reform movements on issues relating to caste discrimination among other social issues, the updates stated. “Civil society is important not only for democracy but also for good life,” the professor stated. She argued that it was civil society which monitors government activities, which then leads to restraint on the abuses of the state. Despite this constraint, she pointed out, civil society organisations play a great role in the Northeast region because it mediates political situations and highlights broader social security concerns. According to Professor Chandhoke, civil society organisations not only provide space for dialogue and debate but also promote the ‘good life’ as talked by Socrates. Chandhoke asserted that the most important challenge today in India was in finding a way to how people who speak different languages, believe in different religions and belong to different communities can live together in harmony to enhance the rich diversity of India.